A couple posts ago I statted up Invisible Woman using the alpha release rules (such as they are) for Mystery Men! Now, to show how the powers can be used to build an essentially non-powered character (and to give some attention to the other big name in comics), I decided to apply some stats to Catwoman. Even though, for all intents and purposes, Catwoman has no super powers, it is fairly obvious that her abilities far exceed that of a normal human being, even within the fantasy universe of comic books. The powers in the game are really meant to represent results – i.e. what a character can do – not freakish abilities that are handed out by atomic blasts, radioactive animals or sharing some DNA with the gods. In that sense, Catwoman should definitely have some powers. Wow – rolled extremely well for Dexterity. If I was doing a straight conversion of the character, I probably wouldn’t have gone that high with Dexterity, but since I’m randomizing this, we’ll go with 25. The new incarnation wears goggles, which we’re going to invest with the Darkvision power (limitless) for 1,500 XP. Catwoman also carries a whip (ranged weapon, 10′ range, 1d6 damage). She wears leather armor. The total XP cost of Catwoman’s powers would be 12,000 XP, leaving her 38,000 XP to put towards her level, making her a 16th level villain. Powers: Limitless – Alarm, Feather Fall, Find Clue; 1/issue* – Moment of Prescience. * At the moment, I’m doing time in Mystery Men! in terms of panels (about 1 minute), pages (10 minutes) and issues (1 day). One commenter last time didn’t care for this, and I’ll admit it’s cutesy (kinda like calling a referee a Dungeon Master), but I kinda liked it. I’m not married to the concept, though, so I’d love to hear what others think of it. 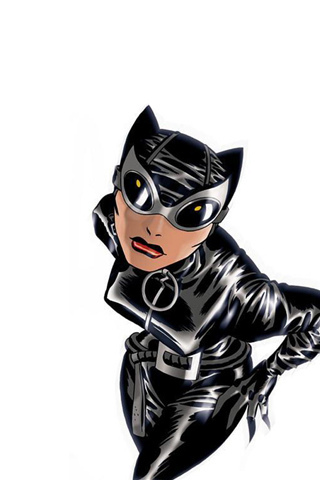 Catwoman is the property of D.C Comics and the application of Mystery Men! stats and use of images of the character in this blog post is not intended to threaten or infringe on their copyright or intellectual property. Top image is Julie Newman as Catwoman from the greatest TV show ever made, and the bottom image is by Darwyn Cooke. Nice one – another good writeup, and I really like the panels/pages/issues idea, it feels right. Undecided on how I feel about this. Seems cool but…a 25 Dex and a 10 Charisma? a 10 for Catwoman? Random rolls aren't best way to go for conversions. Character generation sure but this just seems a bit off. I'm following this with interest. Like the direction your going overall. However I tend to agree with Barking Alien, 10 Charisma for Catwoman? I understand your reasoning behind the panels/pages/issues, but it doesn't “sing” to me. Isn't the 10 out of 2-12 though, not out of 3-18? I was under the impression normal humans had scores 2-12 in this system, though admittedly I don't fully comprehend it yet. Other than that, so far this game is intriguing the heck out of me. It's like the first superhero game I've seen that isn't too caught up in all the wrong things. Nice, clean and simple. And very clever as a D&D modification, too. Good comments – and very helpful. As a player, I approach rules as mostly ignorable or changeable, so I forget that some folks have the opposite perspective – I can definitely put in language to allow folks to talk in terms of rounds, turns and days. Ability scores in MM run from 1 to 30. Scores of 2 to 4 would be considered average for a normal human, while 5 and 6 would represent the top levels for normal, real world humans. So, Heidi Klum probably has a Charisma of 6, and marathon champions a Constitution of 6.